As with the murder mysteries that dominated my early teens, my reading nowadays rarely revisits the horror novels that I loved in my late teens. So it's many years since I last read one by the biggest name in the genre, Stephen King. I only even downloaded Revival - one of three new books King published in 2014, so I guess he's as prolific as ever - when there was a cheap kindle deal for it, and I figured I'd get a good week or two's worth of commuting reading matter for a couple of quid. 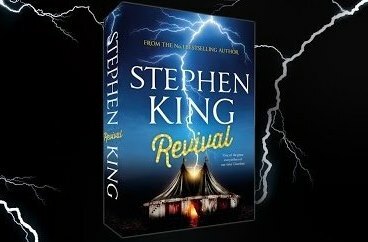 And that's true enough; King's not exactly known for being concise and Revival is a rambling story that only really starts to build to its point about 80% through. The narrator is a rock guitarist who's spent a lifetime playing in small bands. Every few years he also bumps into Pastor Jacobs, a figure from his childhood. When he lost his family in a car crash Jacobs also lost his faith, but later in life he cynically starts a moneymaking career as a healing preacher with a revival ministry. The cures he carries out are real, but they're part of a mysterious lifelong experiment, and for some there's frightening side effects. After such a long buildup the revelation at the end of the story is something of an inevitable anti-climax; I might have felt differently if I had been reading other King books all these years and was tired of his rambling style, but as it is even if the destination was on the disappointing side, I enjoyed the journey.